Georgia’s Central Region is a large, diverse area with manufacturing, agriculture and logistics businesses along with new opportunities in the film industry and in the rehabilitation of classic downtowns. The region’s 25 counties are convenient to Hartsfield-Jackson Atlanta International Airport and the Port of Savannah. Overall, it seems Central Georgia is starting to flex its economic muscle. Jasper County, about 60 miles from Atlanta, is primed for a big 2017. The Jasper County Industrial Park in Monticello, the county seat, is at 80 percent capacity with only five acres of available space. Therefore, the focus is shifting to the 50-acre Minetta Crossing site, which is being marketed as a green park, has railroad access and is drawing attention from prospects. Thomas and Thwaite, a manufacturer of wood flooring, will open a 20-acre facility this spring and create more than 20 jobs. Norton Packaging expanded and doubled its size and its workforce to 66 employees who produce rigid plastic pails and cans. Water, Wind and Soil, which makes grass-like construction mats, has opened a facility and has 35 employees. David Dyer, executive director of the Development Authority of Jasper County, says the area is courting 13 prospects that could result in 400-plus new jobs. Downtown Monticello has its storefronts filled, so the city is looking for land close to town that will support microbusinesses in smaller commercial retail units. Baldwin County purchased land for a new 1,643-acre Sibley-Smith Industrial Park, the state’s latest mega site. The site has utilities, access to rail and is certified Georgia Ready for Accelerated Development (GRAD). “Once it was bought, we started to get a lot of good activity for companies who want to move here and invest and grow,” says Matt Poyner, executive director of the Development Authority of the City of Milledgeville and Baldwin County. Sparta Industries, a manufacturer of HVAC duct liner insulation, will establish a new plant at the former Rheem Manufacturing facility in Milledgeville. This venture is expected to create more than 1,000 jobs and represents an investment of $22.5 million. Strapack Inc., a Japanese firm that manufactures plastic strapping used in packaging, has begun production in the building purchased from the county. Initially, Strapack’s estimated $4-million to $6-million investment includes 10 new jobs. Neighboring Wilkinson County saw German-based chemical company Zschimmer and Schwarz invest $15 million in an expansion. The project includes 75,000 square feet of laboratory, office and warehouse space on a 300-acre site and should create 60 jobs. In Morgan County, luxury tile manufacturer Mannington Mills started the second phase of its expansion, which will add 50,000 square feet and produce 25 to 50 new jobs. Local manufacturers also continued to add jobs last year. Bard Manufacturing, a national HVAC company, added 180,000 square feet and created 34 jobs. Morgan County is constructing a $35-million hospital to replace the existing Morgan Memorial Hospital built in 1960. The new facility will be built on the U.S. 441 Bypass on a $1-million tract of donated land. Growth is ongoing in Macon-Bibb County. Pat Topping, senior vice president of the Macon Economic Development Commission, says more than a dozen companies expanded in 2016, creating 600 jobs with an investment of $30 million. Seven new companies also arrived, representing a $40-million investment and 300-plus jobs. In downtown Macon, ground has been broken for the Lofts at Capricorn, 137 apartments to be constructed adjacent to the old Capricorn Records recording studio. This studio, where The Allman Brothers Band and other Southern rock bands recorded albums in the 1970s, has been donated to Mercer University. It will be used as part of the school’s music program and serve as a music incubator. 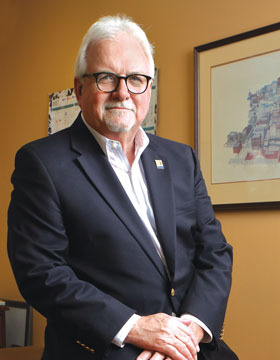 The Development Authority of Monroe County broke away from the local chamber of commerce and became an independent agency, hiring Kenneth “Bo” Gregory Jr. as president. Michael Norris was brought on as economic development director for the city of Forsyth. One51 plc, an Ireland-based molding company, acquired Encore Industries in Forsyth and will invest $18 million and create 20 jobs. Also in Forsyth, the Monroe County Fine Arts Center, a 1,200-seat auditorium, opened in 2016 at a cost of $8.2 million. The auditorium will benefit Monroe County Schools’ performing arts programs and help attract performers from around the nation. Laurens County welcomed the announced expansion of Valmiera Glass Co. in Dublin. The Latvian fiberglass manufacturer has committed to an investment of $90 million through 2022. The project will create 425 new jobs. Sun-Tek Pet, which produces and distributes dog and cat food, purchased two existing industrial facilities for a 40,000-square-foot expansion. The $2.2-million investment will create 30 new jobs in Dublin. Also in Dublin, Polymer Logistics, which produces plastic bins, crates and pallets, broke ground on a new 75,000-square-foot service center. The company is the sixth international business to locate in Laurens County and will employ 110 when it opens this year. Macon County welcomed EnviroBuilders to Montezuma. The company makes SmartSteel insulated panels for construction projects and could eventually employ as many as 100. The county is in the process of funding a land bank capable of buying and rehabilitating rundown properties for resale. A public-private partnership has created an enterprise zone to begin the revitalization of the downtown area. The 200-acre Richland Solar Center was completed and opened in Twiggs County near Jeffersonville’s Georgia Hwy. 96. Judith Sherling, executive director of the Twiggs County Development Authority, says the county is ideally positioned for future solar projects because it has multiple locations with transmission lines, a number of substations and flat land that is relatively inexpensive. In Putnam County, Legacy Housing took over the manufactured home plant left vacant when Horton Homes closed. Legacy was able to retain about 75 percent of the Horton workforce and will employ 140. Eatonton could soon become a hub for the film industry. Savannah-based Tytan Pictures has leased the old Putnam State Prison, which closed in 2014. Tytan has also leased the town’s old aluminum plant and will transform it into a sound stage and postproduction offices. The company has numerous projects planned for the new location, the first being an international action feature, King Seed: The Movie. Elsewhere in Eatonton, Gemi Trucking subsidiary Ocean Links purchased a warehouse to establish a logistics center, and Healthcare Plus added 30 new jobs, increasing its ranks to 70. Husqvarna outdoor power product manufacturer broke ground for an expansion of its facility in Telfair County. The new press operation, which will make the housing for items like mowers and snow blowers, will create approximately 100 full-time jobs and 100 seasonal jobs, says Paula Rogers Anderson, president of the Telfair County Chamber of Commerce. Husqvarna currently employs more than 1,000 people at the plant in McRae. Telfair County’s renewed lease on the privately owned McRae Correctional Facility will allow 350 jobs to remain in the area. Houston County saw the addition of $120 million in investments and 170 new jobs in 2016, says Angie Gheesling, executive director of the Houston County Development Authority. Most significant is German textile company Sandler AG’s announcement that it is expanding into Perry and bringing an additional 150 jobs. Peach County Development Authority focused much of its effort on revamping its marketing and branding approach. The county redesigned its website and changed its slogan to “We Grow Industry Sweet.” Director B.J. Walker says the county is now in a better place to move forward with new partnerships and expansions. Fort Valley’s Blue Bird Corp. added 200 employees for a new second shift at its school bus body assembly plant. Production at the facility has increased by more than 50 percent in recent years. Jones County continues to make incremental gains in its industrial park, says William Mathews, development authority director. The site has received GRAD certification and will be aggressively marketed over the next year. Ben Hill County’s industrial park received GRAD certification to make it more competitive for recruiting new business. Shaw Industries closed its plant in Fitzgerald in 2016, but Jason Dunn, executive director of the Fitzgerald-Ben Hill Development Authority, says there has been interest in acquiring the property. Manufacturing jobs are on the rise in Irwin County. Forest River, which produces commercial trailers, added another line and hired 108 people, says Earl Denham, director of the Ocilla-Irwin Industrial Authority. A sister company, Rockport Commercial Vehicles, also expanded. Wheeler County is receiving a $22-million investment from the state to repurpose a former adult probation facility into a 56-bed regional youth detention center in Caldwell. Construction is expected to start by early 2018 and create 80 jobs. Dooly County landed a pair of $100-million projects, says Bob Jeter, director of the Dooly County Economic Development Council. Tyson Foods is upgrading its chicken processing line, adding 842 jobs. In addition, Ensyn, which produces biofuel from forest and agricultural residues, is constructing a facility that will create 138 jobs. As a whole, the region continues its economic expansion, delivering substantial job growth.